So I’m giving this its own post, as I want to keep the main Hero Equipment page mostly about the available sets, certainly with all the new sets added to the game. 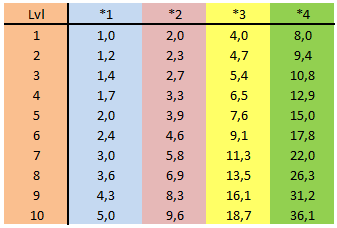 Below is a chart with the percentages bonus each of the currently 4 Tiers of equipment bonus do, from level 1 to level 10. The four Tiers (marked *1-*4 in KABAM emails) start out at 1%, 2%, 4% and 8% bonus respectively, but can grow to considerable amounts if you happen to be lucky enough to get gear at level 10! Use this as a reference for determining end-game gear specs, or whatever you like :). Thanks to QuietschEnte for confirming the numbers! This entry was posted in Articles, General and tagged bonus, equipment, gear, Hero, hero equipment, kabam, kingdoms of middle earth, KoM, level, multiplier, tier, tiers, upgrade by beardmonkey. Bookmark the permalink. Thanx for this very interesting Topic. Do we have to use this tab only for the sword gear? because it can’t work for all gear, no? yes goes for all gear! just updated, but thanks anyways! Is upgrading enhanced gear more effective? Or should you upgrade then enhance? I haven’t figured that out yet. I have an article on that published just this week! But the answer is NO, doesnt matter what you do first! How do you tell which tier a piece of gear is? They used to have numbers, but now that you can upgrade everything just starts off saying 1 since it is at the first level. Sorry if this seems like a silly question, I stopped playing for a while and only just started again the other day. Is it just one of those situations where you either have to know or figure it out? GEar has two properties concerning this: level of the individual bonus attributes, and overall level of the piece of gear. bonus attributes currently come in 4 levels, denoted 1*-4* in KABAM messages. The higher the bonus level the more. 1* starts at 1%, 2* at 2%, 3 at 4% and 4* at 8%. To fully make use of the potential you need to raise the overall level of the gear piece, using Valto runes and Crimson crystals. Gear starts at lvl 1 and can be upgraded to level 10 max. When you upgrade a piece of gear, the bonus attributes and base stats increase in value for each level exponentially. Lets take Ent gear as example. It has two 1* life bonuses, which mean 1% bonus at gear level 1. When you upgrade to level 10, the life bonus grows to 5%! So a 1* bonus attribute runs from 1% at lvl 1 up to 5% at lvl 10. Likewise, 2* attributes run from 2% to 9.6%, 3* runs from 4% to 18.7%, and finally a 4* attribute runs from 8% to 36.1%…. thanks for the info! added to the article….